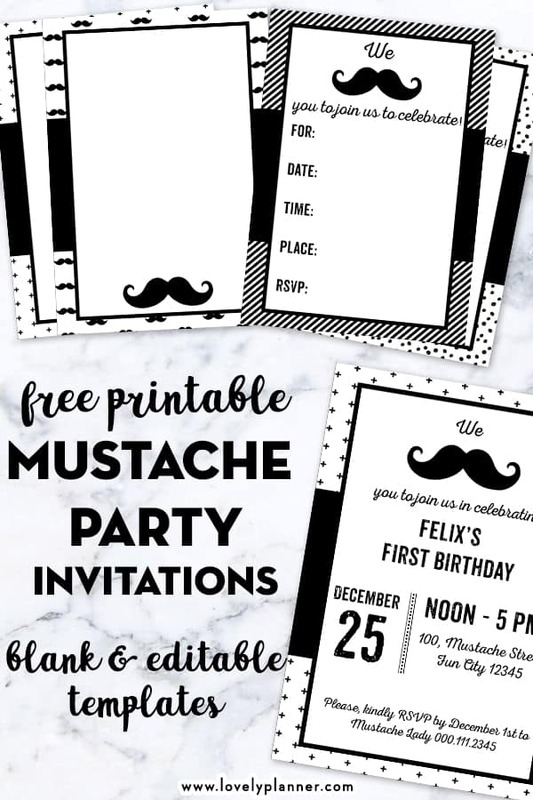 These free printable Mustache Party invitations will be perfect to announce a baby shower, baby’s first birthday or any other event for which you’d like to have a Mustache Party theme! 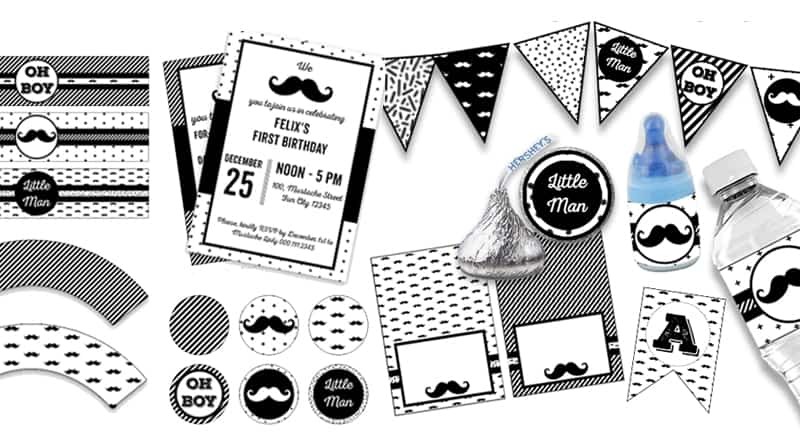 4 black and white patterns: mustache, irregular dots, stripes and cross. 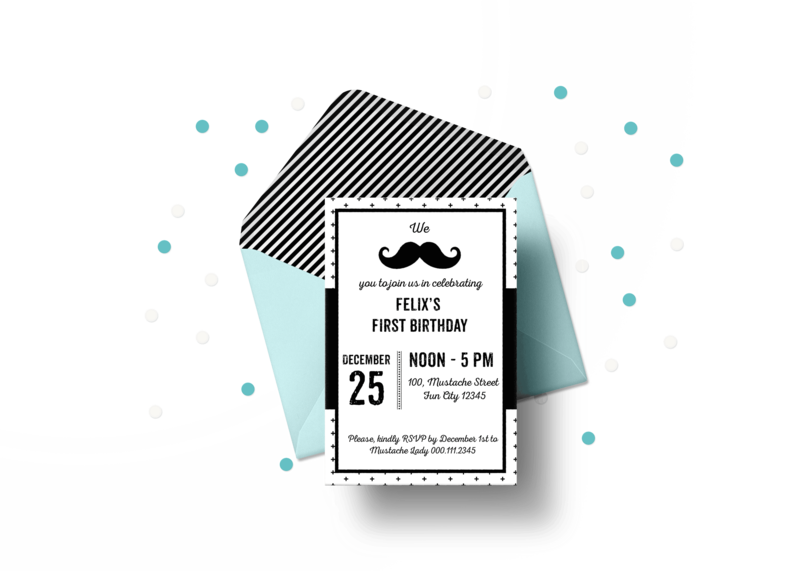 TIP: The background of all these invitations is white and the design is black and white, which means that you can print it on any colored paper, kraft paper, white paper or other – whatever fits your decoration best! 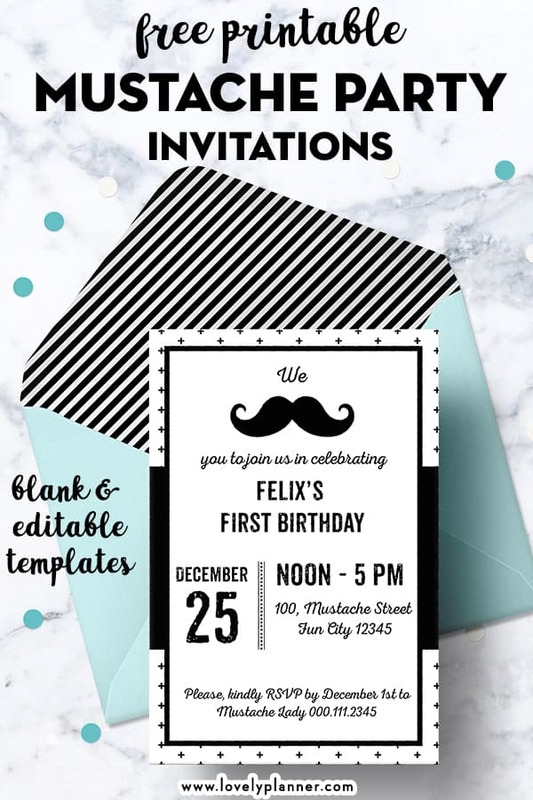 If you choose the completely blank or fillable design, you’ll be able to add your party events either by hand (print and fill) or using a photo editing software on your computer or online before printing. 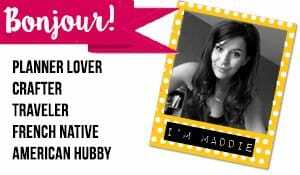 If you’re not very tech savvy or if you just want to keep it simple (nothing wrong with that!) adding your event details by hand is probably the easiest! However, if you want to add your event details on the computer before printing, I’m giving a few tips on how to do so at the end of this article. Most of the PDF I share are not editable. However I may sometimes share one with you that is editable, if so, I will always specify it. When a PDF is editable, that means you’re able to edit some of the text. To be able to do so, you’ll need to open the editable PDF file with Adobe Acrobat Reader (you can download it for free). The elements of text that you can edit will appear with a light blue overlay. Double click on each element you want to edit and type in your text. When customizing an editable PDF I recommend you download and install the fonts I used to create the file, prior to opening it. 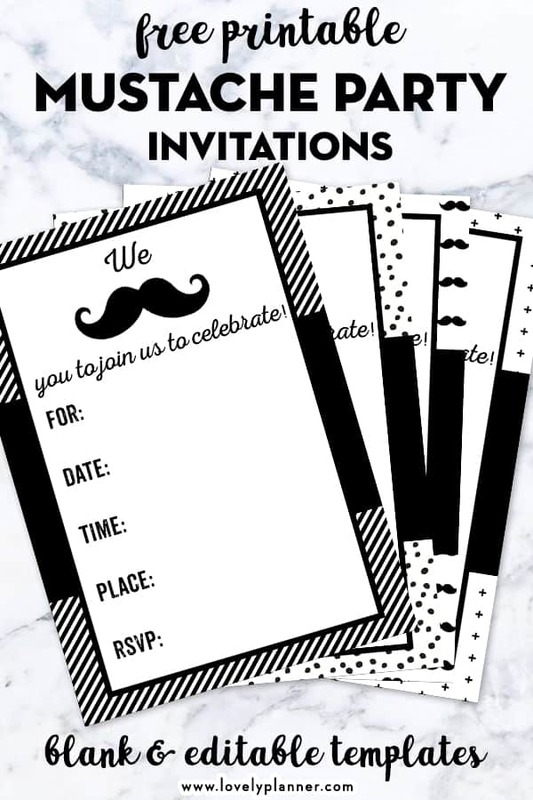 If you don’t have the fonts I used installed on your computer, then your invitation will look very different. Fonts used to create this invitation: Nexa Rust Slab Black Shadow 01 and Nexa Rust Script L O. You can download them here for free. 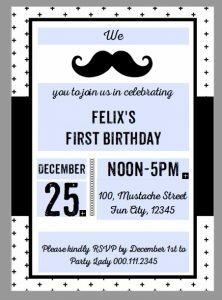 Create a design using CUSTOM DIMENSIONS – in this case, we’ll create a design that is 5×7″, the invitation size. Upload your own image = the blank invitation template that you downloaded from my blog. 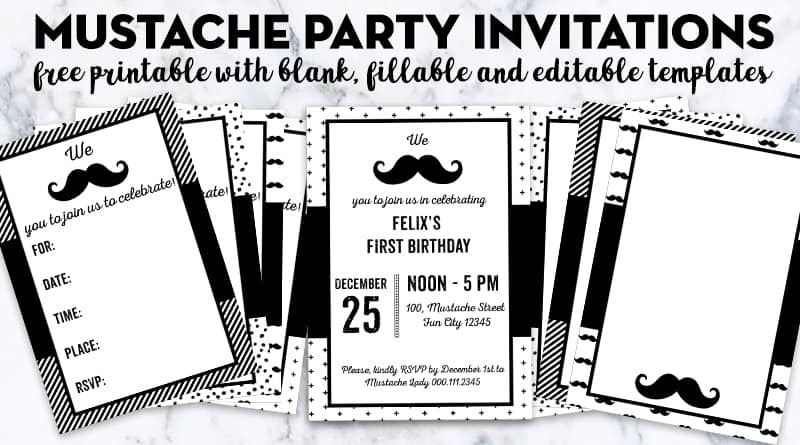 Add text zones and pick your font(s) to add your invitation details. When you’re happy with how it looks, download your design (button “Download”).